I’m including this commercial announcement for the Vermont College of Fine Arts Writing for Children and Young Adults program as part of my Adventures of a Debut Author posts because I owe a great deal to the school, the staff, and the incredible faculty there. At VCFA, I discovered my voice, my passion, and I found my agent at the AMR! Hallelujah! Saints be praised! An observation I’ve made over the years is that many successful writers continue to support organizations that helped them along the rocky road to publication. Be it SCBWI, a local writing group, or other esteemed writing programs, some of the finest authors and illustrators I know seem to find a way to “dance with the one that brought them.” While I’ve got a lot of two-stepping down the bumpy road to publication success ahead of me, I plan on demonstrating my gratitude to VCFA and SCBWI by chipping in any way I can. Read the little ditty below if you’d like to know more about the upcoming VCFA WCYA Alumni Mini-Residency. If you have any questions at all, shoot me note and I’ll be glad to answer it! Hey, alums! Hope to see you there!!!! The annual WCYA Alumni Mini-Residency, known as the AMR, is a weekend conference that mirrors the VCFA residency experience while focusing on the professional aspects of one’s writing career. During the event attendees participate in a Master Class presented by the industry’s finest award-winning authors; interface with editors and literary agents; are coached by publicists; attend lectures and workshops led by VCFA faculty members; and are given multiple rich opportunities to elevate their writing careers to the highest level possible. Every year WCYA alumni – from recently graduated to those from residencies long passed – return to campus for inspiration, collaboration, and in celebration of one another’s successes. The dates for AMR 2016 are June 17 to 19. Registration opens on February 15. Please take a moment to review the AMR 2016 information posted on the VCFA website. You’ll find that the faculty and programming planned for this summer’s event is incredible. Whether you’re pre-published or have a series of books with your name proudly printed on the spine, the WCYA Alumni Mini-Residency is perfectly suited to support your writing career, no matter where you are in the publishing business. Today has been a thumbs-up kind of day! First of all, an interview I did discussing teacher guides with the highly respected TeachingAuthors.com went live today. In it, I talked about my take on creating companion guides for books written for kids. Below is a wee snippet from today's post. As a classroom teacher, I scoured countless guides and activity games in search of lessons that would enhance the reading experience for my students. I looked for clever games, interesting new ways to practice vocabulary, dramatic interpretation, and introspective discussion questions. And, when I connected with the content of a companion guide, I kept that particular book in a prominent place on my classroom bookshelf to be used time and time again. Like the good resources I used back then, I now work to create guides that will keep the book in the heart of the child reader and the hands of those who care for them – my mantra. And then, if the TeachingAuthors.com post wasn't wonderful enough, a friend and fellow RA from LA, Alexis O'Neill acknowledged my work on the current SCBWI Bulletin. In her article "Creating Teacher's Guides for Your Books", she notes that I state that guides fall into three main categories: Teacher's, Activity, and Discussion guides - and I do! Alexis also touts the work my compadres and I have been doing at ReaderKidZ.com. Well, I've certainly been feeling the love today! Thanks, TeachingAuthors.com, Alexis, and SCBWI for the nods. Today's been absolutely amazing. I can't wait to see what great things tomorrow will bring. Got your sunscreen with ya? Sandals and snorkel? Your sleuth-like sense of snooping adventure? Then you, my friend, are ready to play the Simple Saturday Beach Blanket ABC's with me and about 70 SCBWI friends from all around the world. Come on! This is going to be fun!!!! This game can be played one of two ways - with letters or with the initial sounds of objects. Either way, Beach Blanket ABC's is a marvelous way to reinforce the sequential patterning of the alphabet. All you do is convince your band of travelers to gawk out of the car window and, jointly, search for a particular letter together. Letters can be found on billboards, buildings, neon signs, and license plates. 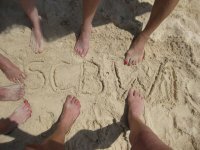 While basking on a beach in the Bahamas, I convinced a wacky band of RA's to play Beach Blanket ABC's with me and we had a blast! Want to see what we came up with? It's great! I found a double whammy for the letter B - a boy with a bucket! D is for driftwood or a Rasta Man's dreadlocks. E is for Mary's elbow. I found two for the price of one for the letters G and H. Check out George chilling out on a hammock! K is for the SCBWI kite. L is for lounge chairs. N is for Chris' Australian nose. O is for the olives in my salad. P is for parasail or pirate. That's right, I said pirate. Q is for the quarter that just happened to be laying on my chair. V is for Vicki sporting the sunnies. X is for X marks the sandy spot! Z is for a cool zebra-striped shell. Now you know your sandy ABC's. Thanks for hanging at the beach with me. And huge thanks to all my SCBWI buddies for the help and all the fun! Ever taken a trip with kids who are bored out of their minds? Squabbling? Asking how much farther? He's breathing on me! She's looking at me. No! No! No! Let me teach you a game that just might save your vacationing sanity. The Simple Saturday Beach Blanket ABC game is free, fun, and the stuff that can make memories out of molehills. To play this game all you need is a pair of sharp eyes, a destination and you're off! Tomorrow's game playing destination will be on a private beach in the Bahamas. That's right, we're taking a long, drawn out, boring trip to the Bahamas to play our game together. Tough duty, but someone has to do it, right? Until tomorrow, bon voyage, dear friends!